Within gastronomy there are different specialisations, and each one, without taking predominance, has been elevated to extraordinary levels in the world of catering. When a Michelin star chef with two Repsol suns, Manuel Alonso, Restaurante Casa Manolo (Daimus – Valencia) joins forces with a renowned pastry chef specialised in ice creams, Jose Montejano, the end result can be nothing other than a gastronomic experience such as the ice creams of SUAU. The project was created by the beach of Daimus, next to the restaurant Casa Manolo, with the objective of expanding through the whole Mediterranean. PORCELANOSA Group, with its solid surface KRION, forms part of this creation in the form of a counter created with KRION 1100 Snow White, and the machined upper section for placing containers of toppings. 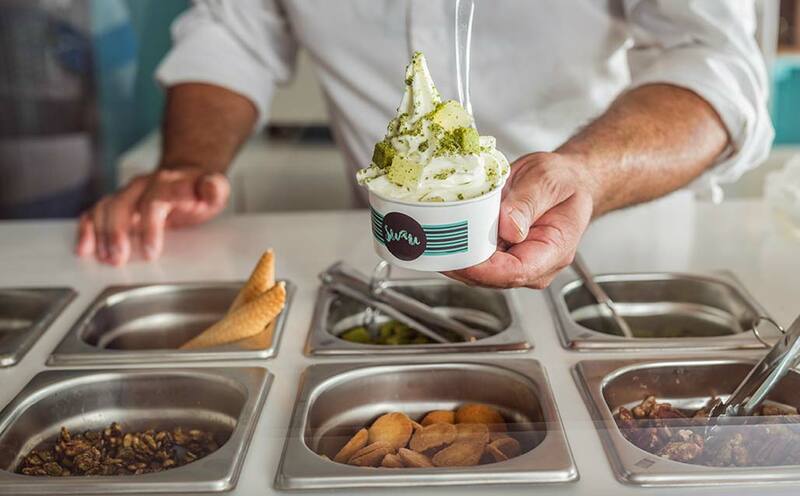 Each day, the ice creams are made in a completely traditional way in the workroom of J. Montejano, and each morning the toppings are made in the restaurant of Manuel Alonso, all with local, seasonal raw materials. SUAU: happiness made into ice cream.